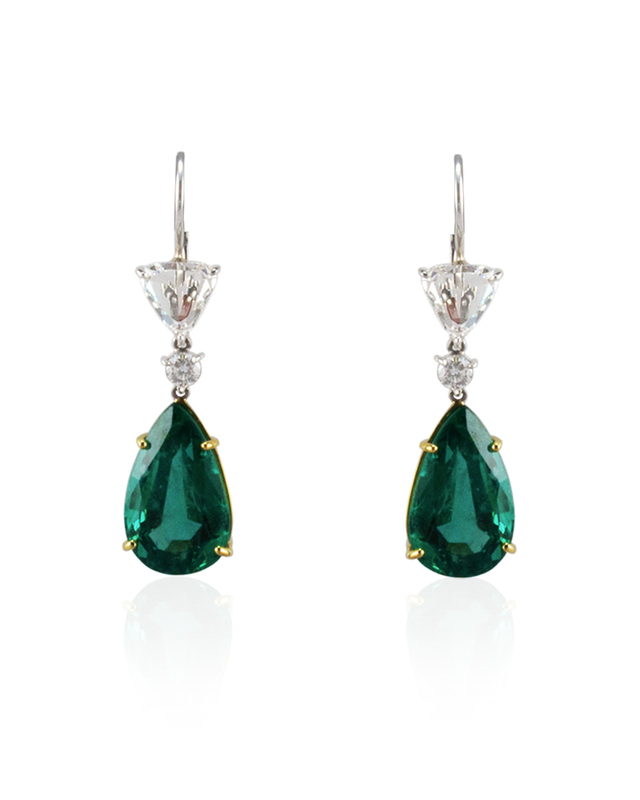 These dangle drop earrings feature two pear-shaped emeralds in a rich yellow gold prong setting totaling 14.11 carats that exhibit a vivid grass-green color and are accompanied by a PGS gem certification. Two triangular rose cut diamonds are prong set on the top totaling 2.34 carats with E to G color and VS1-VS2 clarity and come with a GIA certification. Two sparkling round brilliant cut prong set diamonds adorn as connections totaling 0.25 carats. Designed in rich 18 K yellow and white gold in a bright polished finish, these earrings are minimal in design, but bold in style.